Use these quick buttons to take pictures, make short videos or sound recordings, take notes and make entries on the fly. Once you’ve decided to add a new entry, type your text and tap when you finish. Advance character by character with single taps on the left or right margins of the document, or long-tap to advance word by word (iPad); you can use the the custom accessory keyboard on the iPhone for this . Tag Journal accepts text and markdown formatting rules. In iPhone you find the # symbol above the keyboard for the titles. In iPad, you have an accessory keyboard with more markdown shortcuts. When applying Italic, Bold and Bold Italic with Markdown syntax, the words/phrases are colored in edition mode. In this way it will be easy for you to identify those words/phrases being in edition mode. If you want to disable this option, go to Settings - Editor's Font and uncheck "Syntax Highlighting". Type # before the title. This way, it will always be in bold and your entries will look neat in the Timeline. The default typeface is Menlo, but you can change it. Go to Settings -> Editor’s font. You can also change here the line spacing. To enlarge/reduce the font, simply pinch to zoom in editing mode. You have four choices. It is possible to import text from other apps that support the feature “Open in…”; for example, in Dropbox. Add photos, short videos, sound recordings, notes, tags and geolocation using the buttons found at the bottom. You can load up to 5 pictures simultaneously at a time but the entry may contain the quantity of pictures you want. Make short videos easily. You can review them within your entries or in Gallery section. Localize your places tapping on . You can also add your place to favorites and find nearby places, through Foursquare. Use the sharing icon to print or to send your entry by Mail or iMessages in PDF, Markdown, or HTML formats, or send it directly to Facebook! 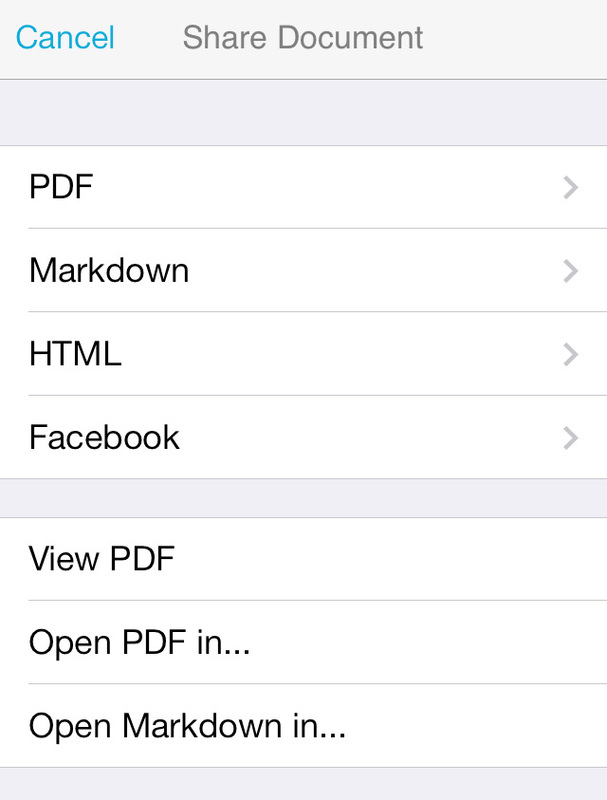 You can also open your texts in other apps using the option "Open Markdown in". Entries are ordered by date with the most recent first. Use to filter by date or to add a new entry to a specific day. Use to retrieve an entry. To cancel the filter, press . You can also add a new entry here with the button. To merge the text from different entries, tap on , then select the entries and tap on "Merge". Only text will merge; photos, videos and recordings are excluded. To delete an entry, simply swipe to the left on it and then press Delete. All the photos, videos, notes and voice recordings you created using the quick buttons, as well as the ones created within an entry, are stored in their own section: Gallery, Notes or Recordings. Spare photos, videos and voice recordings that do not belong to a specific entry can be included in a new entry simply by tapping on them. It is possible to import photos to Gallery from “Open in” supported apps like for example Camera+. You can load up to five pictures simultaneously. At the bottom of each note, you find buttons to delete, share, change the background color and attach/convert the note to an entry or see the related entry. To move, attach and merge multiple notes at a time, tap on , then select the notes and tap on "Move". Merging notes does not delete the source notes. Take advantage of the power of using tags. It’s a smart way to organize your entries by theme and retrieve them easily. An entry may have more than one tag and you can create all the tags you want using a color from the palette. To change the color of the tag, tap on the colored circle beside the name and options will appear. To delete or rename a tag, swipe to the left. This applies for the tags created by you. Personal, Research, Travels and Work are default tags and can not be changed. In the Edit mode and in Preview (iPad) you’ll find the Preview icon . It displays a Preview of the text in the selected font. You can change the font of this preview in Settings -> Preview Fonts. Tag Journal was designed with your linguistic writing needs in mind. In the custom accessory keyboard, you will find the most popular symbols and characters to speed up your typing. Blue keys are shorcuts to markdown syntax: headings, styles, lists, blockquotes and links. The search key lets you Find–Replace/Replace All; a useful tool for dealing with long text entries. Finally, the browser key gives you access to an internal browser to your favorite links. Add your Favorite Link in Settings -> Favorite Links. In Settings you can Setup iCloud. We suggest you activate iCloud in your iPhone and your iPad. This way, Tag Journal will sync your data in all your devices. In Settings you can enable Passlock and set a passcode. The passcode does not store in iCloud and may be different for each device you have installed Tag Journal. If you do not remember your code and you were storing your data locally, there is nothing else to do; it is your responsability to remember the passcode. On the other hand if you had iCloud set, you can erase the program and reinstall it. As the passcode is not stored in iCloud, you can recover the whole program along with your data. Enjoy Tag Journal and don’t forget to review this app at the App Store.